Felt’s new VR “Variable Road” platform isn’t really a gravel bike but doesn’t fit the typical endurance mold either. It’s as though Felt wanted us to be scratching our heads, wondering where we should be riding this bike — while encouraging us to ride it just about anywhere. The VR frame dimensions are similar to Felt’s previous endurance road platform — the Z Series — but the full bike comes with an adventure-minded component spec that nudges you enthusiastically toward the gravel. We were happy to oblige. Felt explains the FR as a shift in how cyclists ride: getting off pavement to avoid cars and searching out lesser-traveled dirt and gravel segments. Felt aimed to create a bike that’s just as responsive on the road as it is comfortable off road. And this became clear as we hopped on and took the VR out for a spin through Southern California’s diverse roads through Black Star Canyon. Hitting the pavement to start, the Shimano Ultegra Di2 equipped VR2 felt comfortable over cracked asphalt and on harsh cement bike paths. The frame itself was engineered to soak up road vibrations through optimal tube shapes like the VR’s seatstays that change from round at the top to flair in the middle and then finned flat at the bottom. These shapes allow for vertical buckling and compliance over rough roads without sacrificing a responsive ride when you want to get up and go. The VR’s top-tube-chainstay junction is lower on the seatpost than on Felt’s Z Series bikes and this, Felt says, moves the moment of flex in the seatpost above the junction rather than below, thus providing even more vibration absorption. As we left the pavement and hit loose dirt and rocky roads, the VR’s smooth ride was even more noticeable. It wasn’t like riding suspension, but some of the smaller rocks and bumps disappeared, leaving me surprisingly fresh by the end of the ride despite the rough terrain. But the VR’s impressive comfort isn’t just due to carbon layups and tube shapes. 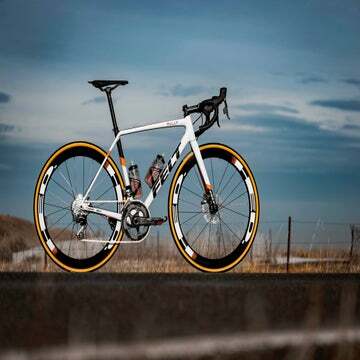 The bike is built around endurance geometry with an upright riding position (185-millimeter head tube) and long, stable wheelbase (1013 millimeters). With a taller stack (595mm) and relaxed 72.5-degree head tube angle, the bike is built for long rides and maybe even an adventure ride. So far, the VR seems like your typical endurance bike, right? Well, this is where the spectrum starts to change. Where most endurance “road” bikes can fit up to 28-millimeter wide tires, the VR can fit Schwalbe’s 35-millimeter G1 tires with ease. For legal reasons, Felt can only claim clearance for 30mm tires but those extra 4-millimeters of real-world clearance makes a huge difference on dirt. It shouldn’t be your first choice for a Dirty Kanza type of ride, but the gravel/endurance bike line starts to blur with this massive tire clearance. Things get even murkier as we look down toward the drivetrain. The top-of-the-line VR2 bike comes equipped with Shimano Ultegra Di2 and R785 hydraulic disc brakes, which is a solid choice for disc-road. But it also includes an FSA SL-K Modular Adventure crankset with a 46/30T chainring combination. This new sub-compact configuration gives the VR another nudge toward the adventure/gravel end of the spectrum since most road bikes, whether for racing or for long endurance rides, typically have a 50/34T combo or larger. Even cross bikes, which sometimes have a 46-tooth large chainring, rarely go as low as a 30-tooth small ring. While this seems strange on paper and makes labeling the VR confusing, the sub-compact combination actually makes a lot of sense when you’re on the road, or on the not-so-road. As we were climbing up Black Star Canyon’s twisty, dirt trail, I was putting the small chainring to use and happy to have an 11-32T cassette as the switchbacks grew steeper. Felt also includes some adventurous details to the VR frame. An extra set of water bottle mounts have been added to the top tube just behind the stem as an attachment point for a “bento” box or food bag. Some of the alloy frames also come with an additional set of water bottle mounts inside the front triangle so you won’t be stranded without fluids on your long adventure rides. And for rainy climates, the VR has fender mounts. Whether you want to label it a semi-gravel bike, all-road bike, or simply an extremely capable endurance bike, one thing was clear: The VR is crazy fun to ride. The bike’s road-specific fit and ride characteristics make trips up paved climbs or long days of training more comfortable while the huge tire clearance, small gearing, and adventure details will give you the push to explore those dirt and gravel roads you’ve been eyeing. Additional models available including three alloy frame options. All are priced at $2,499 and below. ***Several women’s specific VRW models are also available for the same pricing as the VR models but with different paint schemes and touch points.